This is a strange TakeOver card. A lot of the show doesn’t have great build, and none more than this one. There was some interaction in a fatal four way match and then a few words exchanged. That’s it. Still, I’m a fan of both guys and this match has potential. Andrade Almas has looked rejuvenated since the heel turn and though Roderick Strong hasn’t impressed much in NXT yet, this could be the breakout match he needs. I was originally going with Almas, but I predict a fair amount of heel wins on this show, so I’m gonna say Roddy takes this. Considering the story, I think this calls for a Tye Dillinger victory. He’s looking for his place in NXT and needs a win on a major show. He has never won on a TakeOver. However, I don’t see him staying with NXT much longer. Part of me believes he’ll be the tenth entrant in the Royal Rumble and carve out a niche in the lower midcard of Smackdown or Raw, similar to where Apollo Crews is (though both could do more). 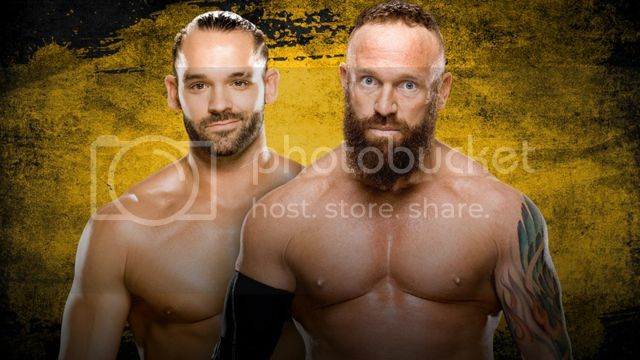 SAnitY is a cool group and though I’m not a big Eric Young fan, their leader should get his first major win here. Tye leaves NXT with a loss. #DIY had a great 2016. Their matches with the Revival and even the one with Akira Tozawa and Tajiri were awesome. They started 2017 strong as well and could be the team to lead the division for a long time. I just don’t think they retain here. I really want them to, but the Authors of Pain have been built up as a big deal and I don’t see them losing their first title shot. It could happen on some sort of fluke, but I think Johnny Gargano and Tommaso Ciampa get the Sami Zayn run. They fought hard to win the titles and had great matches, but ultimately get a short run in favor of a monster champion. Call me crazy, but this is the match I’m looking forward to the most on this show. I’m a huge fan of both Peyton Royce and Billie Kay and have been dying to see them get TakeOver shine. They both deserve it. Check out their recent Performance Center videos posted on Twitter. They’re delightful. Nikki Cross has been great in her current role, which if you watched her on the indies, you wouldn’t have expected it to be a character she’d portray. Also, Asuka has been a dominant champion, but a multi-woman match isn’t a position we’ve seen her in before. Everything also feels fresh because none of these women have had a significant match with the other. Plus, the last women’s fatal four way on a TakeOver was awesome (****1/4 at Rival). I say Asuka retains and heads into Mania weekend nearing a year as champion for a clash with Ember Moon. Similar to Tye Dillinger, part of me senses that Shinsuke Nakamura is about done with NXT. He could enter Mania weekend as champion to help promote that show but I think he possibly makes the Mania card against the Miz or something. Bobby Roode is wildly over and is a good choice to help lead the brand moving forward. The one negative is that a lot of the best guys in NXT are also heels (Aries, Almas, Young, Joe, etc.) Still, Roode against a returning Hideo Itami, Roderick Strong or even singles runs for Gargano and Ciampa could be interesting. I’m gonna say Roode wins a good match, though I’m not expecting great.